big-time, long-time trouble finally here. In 1890 the U.S. government and State of Massachussets began the first attempts to eradicate Gypsy Moth, Lymantria dispar. It was imported from Europe in 1869 in an attempt to breed a better silk worm. Since then Gypsy Moth has become one of the most devastating pests of hardwoods trees in the U.S., defoliating millions of acres annually and prompting extensive research for over 100 years. Numbers in this area in the last few years are rising quickly. 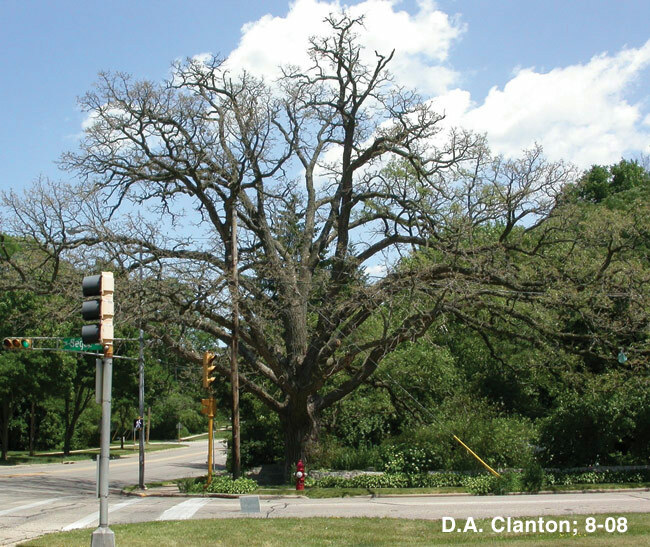 Complete or significant defoliation of trees occurs when Gypsy Moth densities reach high levels. Within the last few years Gypsy Moth has finally spread through Michigan and Wisconsin to Cook, DuPage, Kane, Lake and McHenry counties in Illinois. It is quickly becoming a serious threat to the life of various trees here, notably Oaks, but the list of trees affected is long if conditions are right. Although Gypsy Moth populations can fluctuate between seasons, the numbers in this area in the last few years are rising quickly. Several consecutive years of defoliation can stress a tree to death, or make it susceptible to destruction by drought or attack by another insect or disease. Claims of successful eradication in Illinois by spraying from helicopter the bacteria "BtK" have proven premature, although this method can offer immediate relief and slow the spread. Gypsy Moth is easily identified in any of its three basic stages: the buff-colored egg masses laid on the trunk or underside of branches, even on sheltered surfaces; the black-colored caterpillar, later developing five pairs of blue spots and six pairs of red spots; and the moth, the female being predominately white or cream in color, the male dark brown and black. Males fly but not the females. This insect has an annual life cycle, and its return the following season is all but assured by the mere presence of egg masses. Treatment with a very effective insecticide, a ground-injected form of acephate need be done in spring, allowing time to move into the leaves where it will be ingested by the feeding caterpillars. 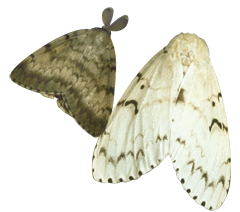 Certain municipalities have plans to contract spraying with helicopters for Gypsy Moth this season in highly infested neighborhoods, so check with your local Forestry Department before making any decision to manage this pest by other means. 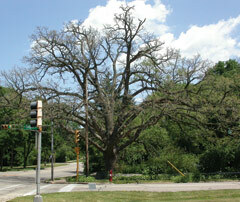 Oak defoliated by Gypsy Moth. Click the photo to enlarge. 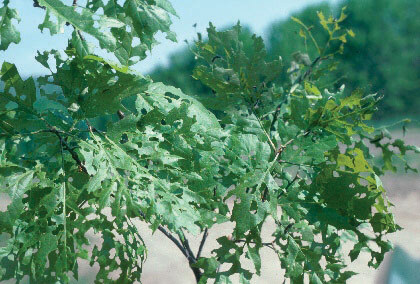 Feeding damage on Red Oak leaves. Click the photo to enlarge. 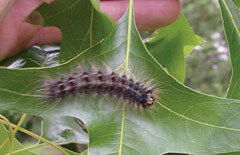 Caterpillar feeding on Pin Oak leaf. Click the photo to enlarge. 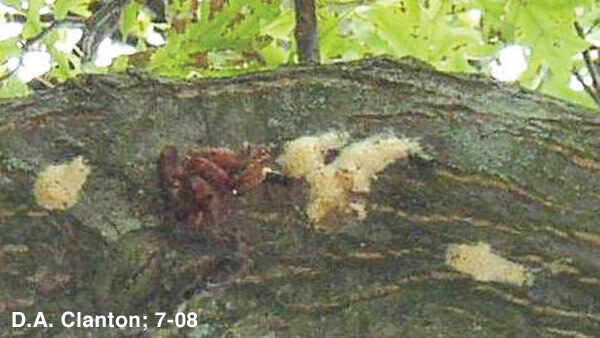 Depleted egg masses and pupae cases on underside of Pin Oak branch. Click the photo to enlarge.